The users page in Ask Ubuntu main page goes up to page 3988 and with about 36 users per page, that goes to about 143K users. In meta, the users page only goes up to page 442 coming to about 16K users. 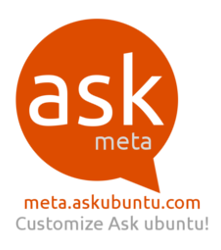 So, how can we get more main Ask Ubuntu users to come to meta? It's basically for better main site management, raising issues that affect the main site and general info concerning how to 'behave' in Ask Ubuntu - how to ask questions, how to answer, community issues, etc. Am not sure whether 'customize Ask Ubuntu' is the correct/perfect tagline there but it's changeable all the same. I only understood two days ago that the site governance is decided here at Meta (even if partially). I imagine that many users do not know about Meta, and those that know may not be conscious of its policy making role. I think that automatic notifications to users regarding important debates or decisions taking place here would certainly help in engaging more folk. Place to ask questions about hosting an Ubuntu 14.04 release party?